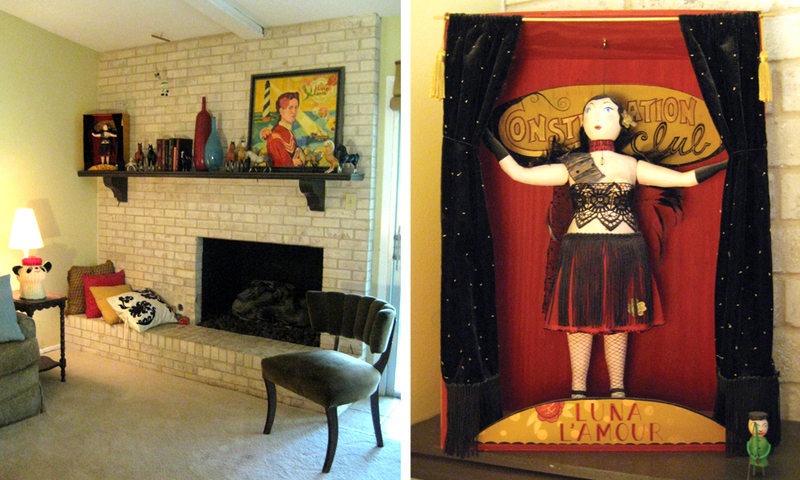 In the living room, a glass curio cabinet houses a vintage clapping cymbal monkey, vintage books, collectibles from her travels and a few clay creatures from artist Eric Satrum. 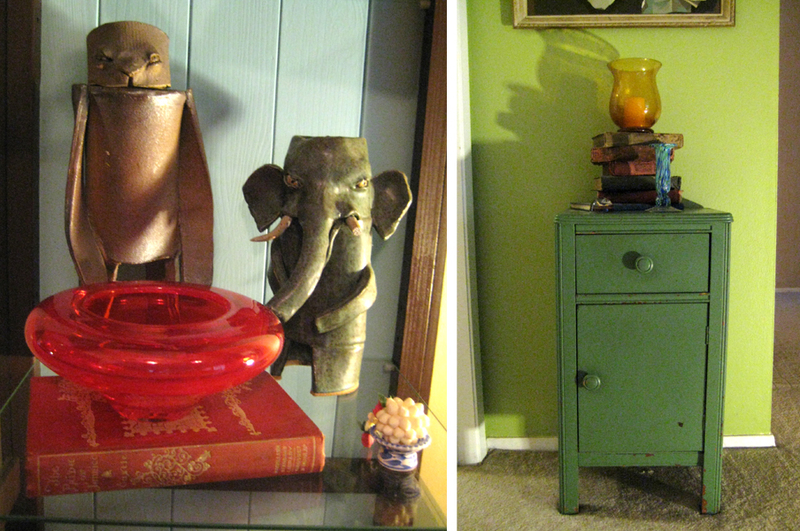 A green side table in the living room matches the set (keep reading) her Grandmother bestowed upon she and her Sister years ago. 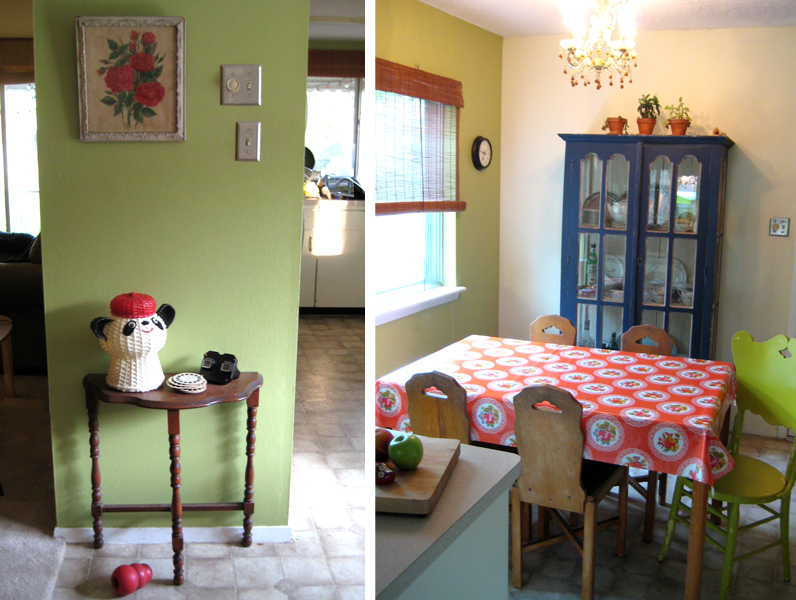 Between the living and dining room is a small dividing wall, perfect for a whimsical display. The red Kong at the foot of the table marks Butchie and Billie’s (the home’s four-legged residents) mobile contributions to decor. The original 1970’s light fixture was replaced with a dainty crystal chandelier, giving the dining space a casual yet girlish sensibility. The guest room which also serves as an office, is visible from the living room and enjoys much light. 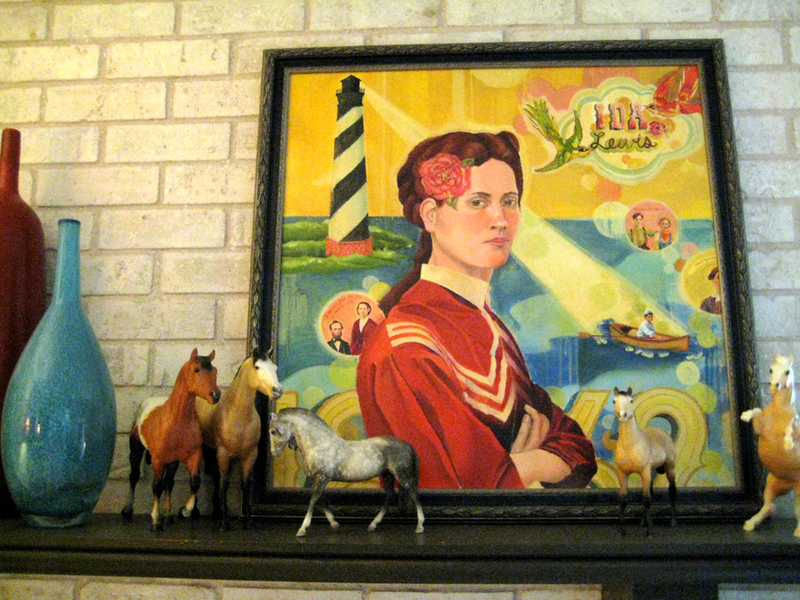 Tanner created an installation of framed silhouettes above the seating area by grouping paper portraits she drew and cut herself, no doubt incorporating the many mugs of her friends who are often models in her paintings. 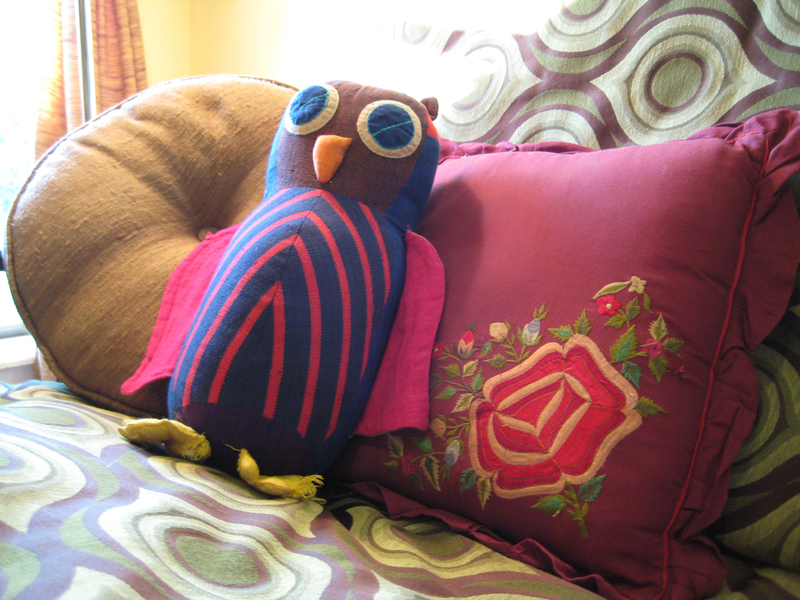 A close-up of colorful, unwinking Mister Owl—a San Francisco Fair Trade gift from her older sister—who’s perched quietly atop Tanner’s mod-print sofa. 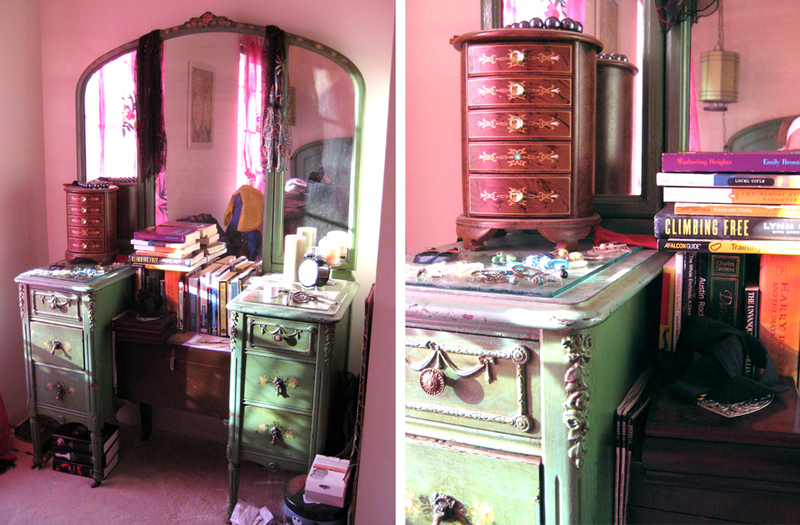 Tanner shares her space with her outdoorsy sister whose room showcases a lovely green dressing table and bed frame (which coordinate with the piece in the living room). Not sure of the trio’s age, they do remember their Grandmother’s neighbor painted the flower details on the headboard and dressing table. The silken flirty flower drapes cast a fuchsia-hued shadow on the room when the sun pushes through them. The Master boasts a warm palette and the original carved-wood room dividers between the bedroom and en-suite bath. 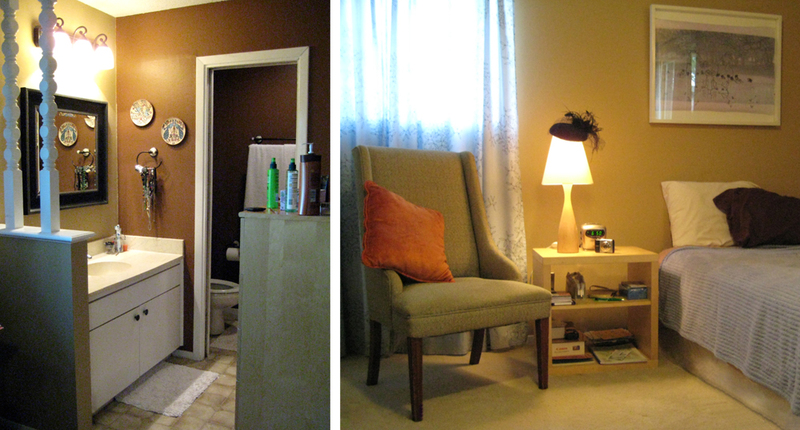 Updating the light fixtures and mirror gives the room a more modern flare. An original by New York-artist Baseera Khan serves as the focal point for the bed and reading area. This Cherry Creek residence, just a stones throw from Austin’s eclectic 78704 neighborhoods, is as pragmatic as it is picturesque. With artist space to create, there’s also ample space to display those creations. A home well-adorned. 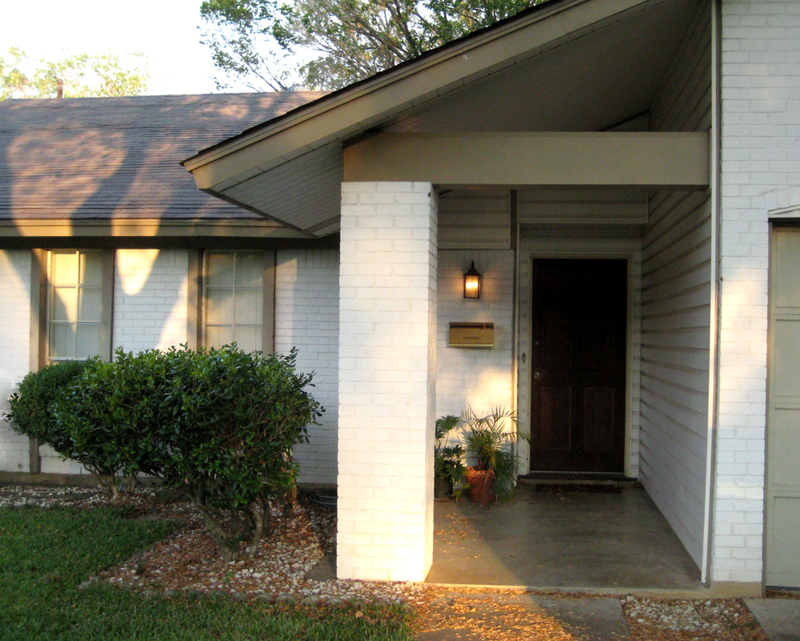 Posted on October 7, 2009 January 21, 2010 by gadorawilderPosted in At Home...Tagged 1970s architecture, Baseera Khan, Cherry Creek, dresser, Ellen Tanner, Eric Satrum, mid-century modern, South Austin. Previous Previous post: Linus and Rigby ~ happy cats.